Christian Pulisic is back at long last with the U.S. national team, but he's not the only returning star who is bound to change the dynamic for Dave Sarachan's squad vs. Colombia and Peru later in October. Christian Pulisic is in form, and he's bound to be in U.S. men's national team camp at long last–and a couple of other established veterans are making their returns with him. Pulisic headlines a 24-man squad called in by interim coach Dave Sarachan for friendlies against South American foes Colombia and Peru later this month, and he's joined by Michael Bradley and Brad Guzan in rounding out another young, fresh-faced squad. The USA will face Los Cafeteros in Tampa, Fla., on Oct. 11 before taking on Peru outside of Hartford, Conn., five days later. It's safe to say that the return of Pulisic, who has been electric for Borussia Dortmund early in the 2018-19 season, is a welcome one. 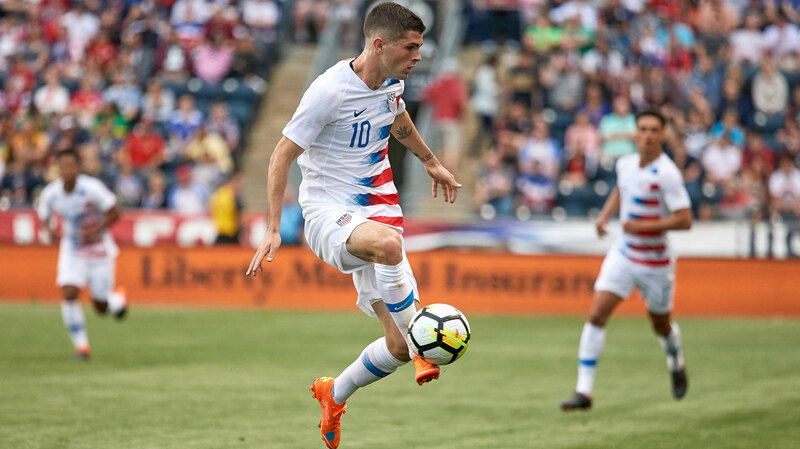 Pulisic has played a total of 89 minutes for the national team since last Oct. 10, 2017, when the USA fell to Trinidad & Tobago and saw its World Cup dreams go up into smoke in the Couva air. Those 89 minutes, which came in a friendly against Bolivia at the end of a trying and exhausting season last May, left Sarachan wanting more from the heir apparent to the USMNT throne. “What I want to see from him is a desire, a passion, energy, excitement and a great effort. That should be each and every player that we bring in, and Christian is no different," Sarachan told SI's Brian Straus prior to September friendlies vs. Brazil and Mexico. "Look at the Bolivia game. It was an outlier from that standpoint. Yes, he was tired. He was coming off a long season—whatever the reasons. But when you come in with the national team, those boxes have to be checked. “We needed a little bit more, and I think he knows that, and so, like I said, he’s got the potential to be a major player for the senior national team. Will he maybe be a captain one day? He’s got the ability. We all know. So when he comes in, I’m hoping that he can be influential and bring the group together in an infectious way, and make sure he’s all in, because we need him. He’s that good." Sarachan will finally have a chance to note the progress that Pulisic, the 2017 U.S. Soccer Male Player of the Year, has made in all of those areas in the coming weeks. The Dortmund star is far from the only intriguing name on his roster. The eventual return of some holdovers from the group that failed to qualify for the 2018 World Cup was hinted at by Sarachan this summer, and he made good on his word by reintegrating Bradley and Guzan, who haven't been called in since that fightful night in Trinidad. The 23-year-old Steffen has laid his claim to the No. 1 job, and he remains the future of the position for the U.S. Guzan, 34, still may have a role to play with a Gold Cup less than a year away, but he's unlikely to be a top-caliber performer for the distant future, even amid a season in which he has played well for MLS Cup contender Atlanta United. It's a bit curious that Horvath, who is out of favor at Club Brugge, gets the nod over Bill Hamid, who has returned to form with a resurgent D.C. United. Fullbacks Cannon and Sweat earn their first call-ups after standout seasons in MLS, but they're likely depth plays on the right and left, respectively, behind an established set of starters. One would expect Robinson, Brooks, Miazga and Yedlin to be the first-choice selections, should Sarachan continue to operate with four in the back. Long, who was called in for the September friendlies but did not play, is also seeking his first cap. Pulisic has two goals and an assist in his last four matches in all competitions, with one goal being a (albeit pretty fluky) game-winner in the Champions League vs. Club Brugge and a late equalizer in a Bundesliga draw vs. Hoffenheim. His playmaking ability and inclination to take defenders on will be quite welcome for a U.S. team that has really struggled to consistently create in the attack under Sarachan's watch. Bradley's integration brings up a number of questions. He's not in camp to be a backup, but if he plays, who sits? Adams, who scored the game-winner vs. Mexico, has been one of the shining stars over the last year, while Acosta and McKennie are seen as key cogs for the present and future. Green and Weah join Pulisic in offering initiative moving forward, while the 19-year-old Amon, in camp for the first time, provides another attacking option on the wing. Perhaps Bradley takes the place of Trapp at the base of a five-man midfield, or perhaps he's really in to help mentor and add a voice of leadership. Regardless, his return is a fascinating development. McKennie's call-up suggests that the bone bruise he suffered against Bayern Munich (oddly enough at the hands of James Rodriguez, with whom he may share a field again if both feature in the Colombia match), is not serious. The thinnest part of the roster comes from the thinnest part of the player pool, where the U.S. is clamoring for an out-and-out striker or four to step up and take command of the position. Sargent is back after missing the September friendlies, as he continues to settle in and earn his place at Werder Bremen. His Bundesliga club suggests that a first-team debut is not far away, and based on his play with the club's U-23s, it's no surprise. The 18-year-old should challenge the out-of-form Wood for top billing, while we're still left curious about what Novakovich can provide after sparingly playing in his previous call-ups. "Andrija didn’t get an opportunity in the last few matches to play, but given his consistent play with his club and the ability to offer a different skillset as a forward, I look forward to having him a part of things with the hope that he will get an opportunity in these games," Sarachan said Monday. Given Sarachan's willingness to call in past players, you wonder if Jozy Altidore would have been included had he not suffered an injury over the weekend with Toronto FC.